Born in 1098, Hildegard was the tenth child of a well-to-do German family. 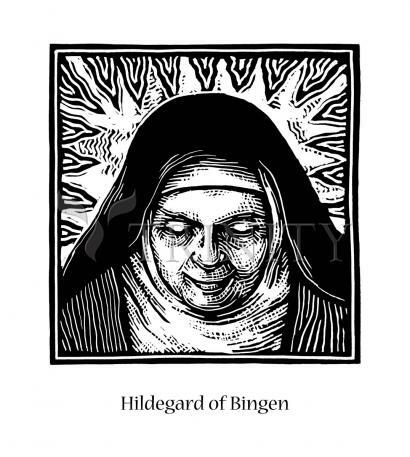 From a young age, she experienced visions connected with illness (perhaps migraines), and in 1106 her parents sent her to a Benedictine monastery, calling Hildegard the family's "tithe" to God. There Hildegard availed herself of the opportunities to learn, and was eventually elected abbess. Hildegard hid her early visions, but after becoming abbess she began to share them through her writings. She also corresponded with many persons, from peasants to kings, who wanted her advice and prayers. In addition to records of her visions, Hildegard also wrote plays, poetry, and music. Many of her hymns and song cycles are still performed today. She even wrote on medicine and nature. Though she was honored locally as a saint, she was not canonized by the Roman Catholic Church until 2012. She was also named a Doctor of the Church, the fourth woman to be so honored. Her feast day is September 17. At a time when few women wrote, Hildegard produced major works of theology and visionary writings. When few women were accorded respect, she was consulted by and advised bishops, popes, and kings. She used the curative powers of natural objects for healing, and wrote treatises about natural history and the medicinal uses of plants, animals, trees and stones. She is the first composer whose biography is known. She founded a vibrant convent, where her musical plays were performed. Although not yet canonized, Hildegard has been beatified, and is frequently referred to as St. Hildegard. Revival of interest in this extraordinary woman of the middle ages was initiated by musicologists and historians of science and religion. Less fortunately, Hildegard's visions and music had been hijacked by the New Age movement, whose music bears some resemblance to Hildegard's ethereal airs. Her story is important to all students of medieval history and culture, and an inspirational account of an irresistible spirit and vibrant intellect overcoming social, physical, cultural, and gender barriers to achieve timeless transcendence. Hildegard was born the 10th child (a tithe) to a noble family. As was customary with the tenth child, which the family could not count on feeding, she was dedicated at birth to the church. The girl started to have visions of luminous objects at the age of three, but soon realized she was unique in this ability and hid this gift for many years. At age 8, the family sent this strange girl to an anchoress named Jutta to receive a religious education. Jutta was born into a wealthy and prominent family, and by all accounts was a young woman of great beauty. She spurned all worldly temptations and decided to dedicate her life to God. Instead of entering a convent, Jutta followed a harsher route and became an anchoress. Anchors of both sexes, though from most accounts they seem to be largely women, led an ascetic life, shut off from the world inside a small room, usually built adjacent to a church so that they could follow the services, with only a small window acting as their link to the rest of humanity. Food would be passed through this window and refuse taken out. Most of the time would be spent in prayer, contemplation, or solitary handworking activities, like stitching and embroidering. Because they would become essentially dead to the world, anchors would receive their last rights from the bishop before their confinement in the anchorage. This macabre ceremony was a complete burial ceremony with the anchor laid out on a bier. Jutta's cell was such an anchorage, except that there was a door through which Hildegard entered, as well as about a dozen girls from noble families who were attracted there by Jutta's fame in later years. What kind of education did Hildegard receive from Jutta? It was of the most rudimentary form, and Hildegard could never escape the feelings of inadequacy and lack of education. She learned to read Psalter in Latin. Though her grasp of the grammatical intricacies of the language was never complete -- she always had secretaries to help her write down her visions -- she had a good intuitive feel for the intricacies of the language itself, constructing complicated sentences fraught with meanings on many levels, that are still a challenge to students of her writings. The proximity of the anchorage to the church of the Benedictine monastery at Disibodenberg (it was attached physically to the church) undoubtedly exposed young Hildegard to musical religious services and were the basis for her own musical compositions. After Jutta's death, when Hildegard was 38 years of age, she was elected the head of the budding convent, but continued to live in her anchorage. During all these years Hildegard confided her visions only to Jutta and another monk, named Volmar, who was to become her lifelong secretary. However, in 1141, a vision of God gave Hildegard instant understanding of the meaning of the religious texts. He commanded her to write down everything she would observe in her visions. Yet Hildegard was also overwhelmed by feelings of inadequacy and hesitated to act. The 12th century was also the time of schisms and religious foment, when someone preaching any outlandish doctrine could instantly attract a large following. Hildegard was critical of schismatics, and preached against them her whole life, working especially against the Cathars. She wanted her visions to be sanctioned and approved by the Catholic Church, though she herself never doubted the divine origins to her luminous visions. She wrote to St. Bernard who took the matter to Pope Eugenius who exhorted Hildegard to finish her writings. With papal imprimatur, Hildegard finished her first visionary work Scivias (Know the Ways of the Lord) and her fame began to spread through Germany and beyond.